It wasn’t yesterday that I was diagnosed with stage 2B Invasive Ductal Carcinoma breast cancer, but it feels that way. I’m still adversely affected by that life-altering event. On a daily basis, I have to make a choice. I can wallow in the self-pity of what if, or I can choose to be grateful I’m alive. Cancer is a wonderful teacher. If you let her, she’ll teach lessons you never dreamed you needed to learn. Often, in the beginning, it’s hard to see and learn the lessons. As the days go by, it’s easier to become more aware of the important things cancer has to tell. But not everyone wants to discover the lessons. Not everyone chooses to look for the good in a hard situation. This is part of the lesson. 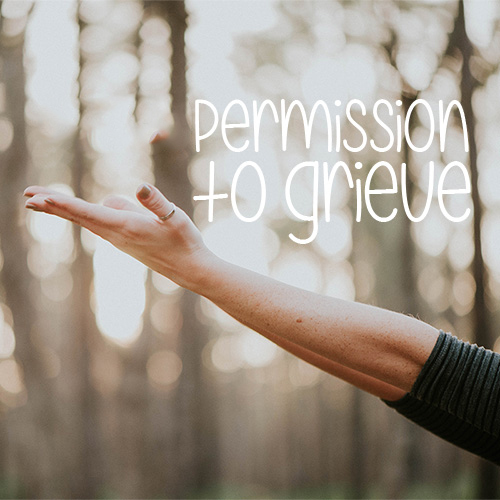 One of the first lessons cancer taught me was to give myself permission to grieve. I didn’t receive this lesson at first, although cancer tried several times to teach it to me. I refused to receive it. I didn’t think I was grieving. I thought I was okay. Losing my breasts had been extremely difficult. I didn’t understand why I’d been chosen to go through the trial of breast cancer. A deep sadness wrapped itself around me. I carried it with me everywhere I went. I didn’t understand anything other than cancer was robbing me of my femininity. One evening, as I sat alone in my room, I heard a whisper. That whisper said, “It’s okay to give yourself permission to grieve.” I internalized that statement and after mulling it over, tears began to fall. And then the dam burst. I was not only weeping, I was mourning. Deep guttural sobs poured forth and I was frightened by the raw power unleashed. I didn’t realize I had so much emotion pent up inside. As I allowed myself time to grieve, the tears began to subside. This did not happen suddenly. It took days and weeks and months, but gradually, the sadness grew less heavy. The next lesson cancer taught me was how to process my anger. At first, I didn’t realize I was angry. I’m not normally an angry person. But as I thought about all I’d endured, I realized I was angry. I was bitter. I was hurt. I didn’t want to have cancer. I didn’t choose to have cancer. I didn’t deserve to have cancer! And, I didn’t want to have surgery. I didn’t want to go through treatment. I just wanted my old life back, the life I had before cancer came in like a wrecking ball to shatter my life into little pieces. Like a child in the throes of a full-blown temper tantrum, I pushed, kicked, and screamed until I’d worn myself out. But cancer told me it was okay. It was okay to be angry. And then cancer did the unexpected. She taught me how to find gratitude. She said it could have been worse. I could have died. I was grateful I hadn’t died. That would have been terrible! Or maybe not. But cancer’s next lesson taught me gratitude can replace grief and anger. I realized that I’d taken a lot for granted before cancer. I hadn’t realized that every day is a precious gift. Cancer taught me to start looking for gratitude. She taught me to choose joy. This lesson, she said, would teach me not only to find gratitude but to remember I had a choice. It was my choice how I’d live each day. I could choose to grieve, to be angry, bitter or hurt, or I could choose to live and be happy. My next lesson came as I completed radiation. After enduring 28 rounds, my body weak and tired, cancer said, “Push through. You’re stronger than you think.” And I did. I made myself get through each day. Little by little, I was determined to get better. I worked hard, even when I didn’t feel like it. It wasn’t easy but I’m glad I kept going. I could have given up. Cancer is a good teacher. I can’t say I like her, but I do appreciate her. I’m grateful for the valuable lessons she’s taught and yes, I might have learned those lessons without her, but with her, I think I learned them a little better than most. I still don’t understand why I got cancer and I don’t know what caused it. I probably never will. But, I can say, finding gratitude has been a blessing and cancer helped me discover I have so much for which to be grateful. If you let her, cancer will teach you important and valuable lessons. Your lessons may be vastly different than mine, but I guarantee, they will be life-altering lessons. You may not be ready to learn the lessons right away, but give her time, and she will teach. Many of my loved ones and friends have died from cancer. Many of them died in excruciating agony and pain. Not all of them would have appreciated the viewpoint I’ve shared but I certainly mean no disrespect to anyone past, present, or future struggling with cancer. It is by far, the most challenging and difficult thing I’ve ever experienced in my entire life, but I’ve chosen to take this awful trial and learn from it. So I hope you’ll understand my heart. My feeling is that cancer, even with all of its horrible ugliness, can be kind in the lessons we learn from it. But we have to be willing to look for the lessons. They’re not always apparent but they do have a purpose.